Hardly four months had passed since the establishment of the town of Newnan in 1828 when seven pioneers of the Baptist Church assembled for the first time in a log cabin (also used as a school) to establish a new church. This church, established “for the purpose of keeping house for God and watching over each other for good,” included three white men, two white women, and two women of color. Early in 1830 the Newnan Baptist unanimously resolved to raise a subscription to build a meeting house, 60 by 40 feet. The church agreed to purchase ten acres of land and the free use of a spring which ran through the property (Oak Hill Cemetery now occupies a portion of this land). Although the new building was not yet finished, the church began holding its services there in April of 1831. 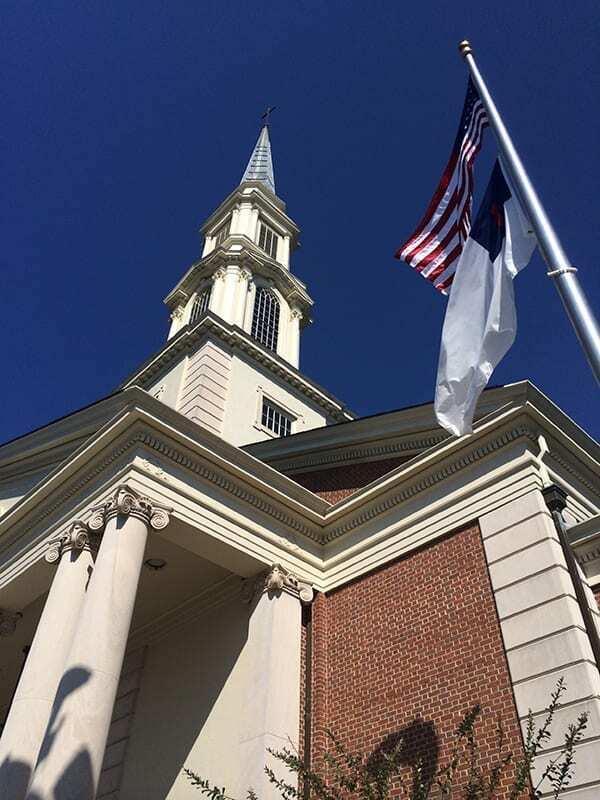 The Baptist Church was continually adding to its membership and by 1838 preaching service each Sabbath was announced by the ringing of the bell ten minutes prior to commencement. A revival in the summer of 1844 added many new members to the congregation, and once more there was discussion concerning the possibility of a new building, this time in a location more convenient to town. After purchasing a lot where the old sanctuary is now located, construction began. The frame was up and the roof was on when in early June of 1845, a windstorm wrecked the building. But the Baptists, undismayed by their disaster, set to work and soon had a stauncher house of worship in its place. The 1850’s were prosperous years for Newnan. New buildings were put up in anticipation of the coming of the railroad. College Temple was established, the first cotton warehouse was built, and the Baptist Church formed its first Sunday School in 1852 and hosted the Baptist State Convention in 1855. By 1861 our country began to feel the pressure of the War Between the States. The Baptist Church was converted into a hospital which filled with wounded soldiers. After the war, lives returned to normal for the 2,700 inhabitants of Newnan. In May of 1882, the question of a new house of worship was raised. By April of 1884, the cornerstone of the present old sanctuary was dedicated, and Reese’s Opera House was secured for services on Sunday while the old, frame building was disposed of and a new one erected in its place. Approximately one year after the laying of the cornerstone, the Newnan Baptist Church was completed. It was dedicated on November 30, 1884. In April of 1885, the Georgia Baptist Convention assembled in Newnan at the Baptist Church. The town of Newnan was honored on April 30, 1886, with the visit of Jefferson Davis, former President of the Confederacy. Two historical events in 1887 were the closing of College Temple and the opening of the Newnan Public School. Activity ceased in February of that year on account of smallpox in the city. By 1890, the town of Newnan was springing up. Newnan now boasted a population of 3,500, a free public school, and factories of all descriptions. The first telephone in the city had been installed and the telegraph line to Carrollton had been completed in 1881. By June of 1890, the first telephone line to Atlanta was finished, followed by electric lights coming to Newnan in August of the same year. 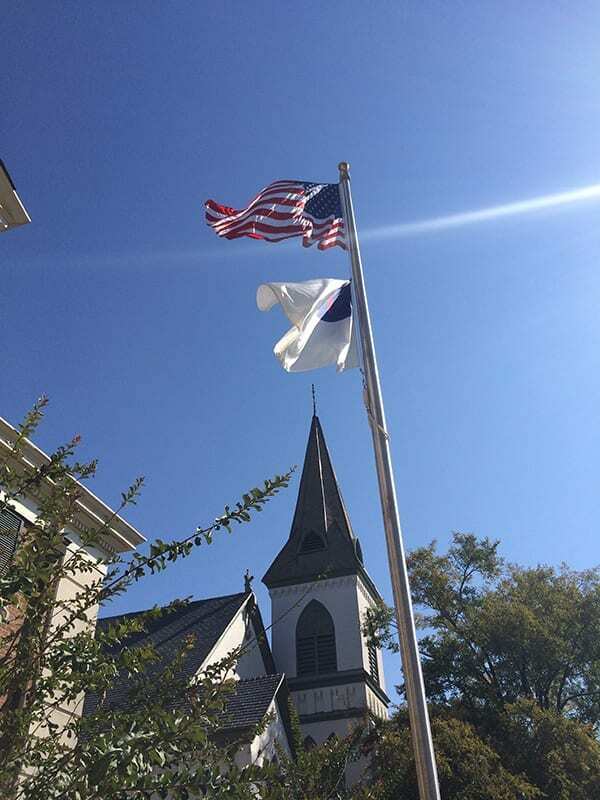 In 1897, a formal division of the church resulted in 139 members withdrawing and establishing Central Baptist Church, one block away from the Baptist Church of Newnan. The Baptist Church petitioned for a name change and thereafter was called “The First Baptist Church of Newnan”. The First Baptist Church of Newnan approved a Sunday School annex to be erected in 1903, the year of its Diamond Jubilee (75 Years). The year of 1928 found the church celebrating its Centennial Service. Renovation of the old sanctuary including new plaster was completed in 1937. The years of the 40’s and 50’s were spent in expanding the building area of the church and the increasing of the membership to do the work of God. 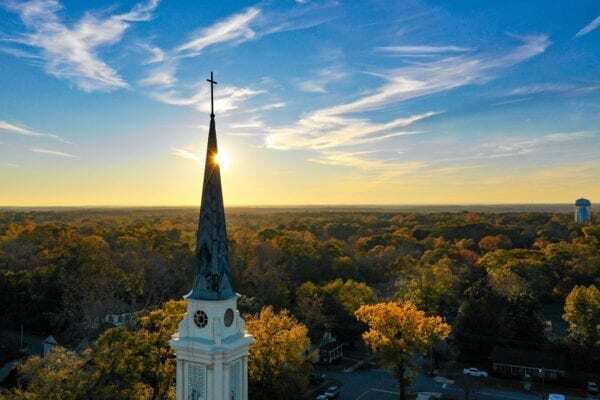 The decade of the 1960’s brought the radio ministry, the ministry for the deaf, the first library, and a new sanctuary to The First Baptist Church of Newnan. The ambitious building project was completed in November of 1968. The 70’s and 80’s brought new programs established to reach the community of Newnan, renovation of the old sanctuary, changes and additions to staff, and continued service to God Almighty.